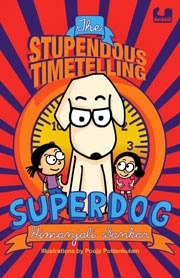 The Stupendous Timetelling Superdog. What a title and what a premise for a story! I was intrigued. I had to read the blurb. The Orange Marmaladies from the Black Hole of Time had tinkered with the Master Clock of Rock and sent the world into a tizzy. All timetelling devices had stopped working. Only silly old Rousseau could tell the time – with short barks and tail-thumps! I must admit I was a bit sceptical – would it be one of those sci-fi thrillers with aliens and all sorts of hi-tech contraptions? Not my kind of book at all! Then I read the first chapter online and wanted more! So when the publishers offered to send me a review copy, I didn’t think twice. The book has been very well-produced – the font, the illustrator’s style – I could see that a lot of thought has gone into every little detail. The page numbers are housed in tiny paw prints. The chapter numbers have been designed to look like the time on a digital display. I knew the little dog-lover at home would be super-excited when he heard the title; I was rewarded with shrieks and a war-dance. It seemed like the book was intended for the 8+ age group, and the kid had just turned six, so I had to read it before it could be handed it to him. It was weird and wacky in a very agreeable way – more of a fun fantasy than sci-fi, and seemed just right for the little imp who was breathing down my neck. There were puns and references to Captain Hook’s crocodile, the Big Ben, ancient Egypt and Harappa – but nothing that a six year-old avid reader wouldn’t be able to make sense of. I like how the information about the marmaladies is revealed gradually (their appearance, clothes and national song! ), and I love that they remain invisible in the illustrations, because they cannot be seen by humans. The characters are very well-etched – every single one of them. Mrs Ghosh is a no-nonsense lady who works for an NGO. She talks to her daughters as if they are adults and that makes for interesting conversation. The girls are spirited themselves. But the star is Rousseau! I found myself looking forward to the parts featuring Rousseau and wishing there was more of him in the book. There is utter confusion in the girls’ school – how does one tell when to ring the school bell without knowing what time it is?! Far away in Germany where Mr Ghosh works, things are much worse - clockwork precision cannot work without clocks! Mrs Ghosh’s parents are away holidaying in the Caribbean where no one cares what time it is anyway! Eventually, Rousseau lands up on TV and the Prime Minister even makes a visit to the Ghosh family home. The superdog is a superstar! The author mocks the media, politicians, astrologers, godmen... even Shah Rukh Khan is not spared! While the fun never ceases, the book manages to bring out the difference in peoples' attitudes towards time, and their behaviour when out of their comfort zone. As an advocate of the slow movement, I see the book as a commentary on how we live our lives with one eye on the clock all the time. Be it environmental issues or thoughts like this one - "Maybe all dogs do, Rousseau knows how to tell us. How much do humans know about dogs and their minds?" - it is cleverly done. The female characters are strong, domestic staff treated with respect. All of it is good, but for me, a book has to earn its pages and I felt it fell short. I would probably have liked it better had it been shorter and targeted at younger kids. But the kid read it and declared it a super-book! He laughed uproariously at the bits I had found hilarious, and enjoyed everything in between too. When he had finished reading, the timepieces in our house mysteriously disappeared. ‘It is the work of a marmalady, they are at it again,’ the mischievous imp told me between giggles as he led me on a hunt to find timepieces under pillows or between books. The “marmaladies” were threatened with dire consequences – after that the timepieces were just turned upside down. Then the kid got busy reading the book all over again and the marmaladies magically disappeared! Months later, I read the book again, this time without looking for build-up and without anticipating escalation in conflict. I saw it from a child’s perspective – a child who thinks time is well-spent if he has had fun and laughs. I could see STSD was entertaining and I could understand why it had been re-read many times. Lovely review. Regarding your point - "All of it is good, but for me, a book has to earn its pages and I felt it fell short". -- I am similarly puzzled by the way our own idea of the book and its worth does not always match with the kid-at-home. We(adults) seem to have a variety of stages on how much we like the book; whereas for the kid it is either they love it or not.